I can testify to the experience that you've mentioned about one visiting the Jungles.Nothing is more thrilling than seeing animals in their habitat at close quarters. On your visit to Nagarhole, did you happen to stay @ Jungle Lodges? Off late there have been good sightings of Tigers,Leopards as well as "Karia" the elusive Black panther. I did get a glimpse of a Leopard along with 2 Cubs which was crossing the beaten path ahead of us, but my set up 70-200 was not sufficient to grab them in the frame. Same with the Sloth Bear. Happened to see one as well. Unlike reserves in the North, crowd in Nagarhole is kind off regulated. Previously they had day trips for Jeep safari's which would allow people to take the Safari by just paying 1800rs and odd. That has been done with and now folks have to Lodge on the resorts to do the Jeep Safari. For normal folks that's a pretty penny to drop. You're photos above are magical. Beautifully rendered in all the aspects. All are exceptional, but the 1st and the 4th one are killers. Thanks for sharing. If you don't mind me asking about the gear you used to shoot these ? Masai Mara is in my bucket list. But to get there home minister ko kitna tael lagana padega soch ke ghabrata hu. Lekin ummeed hai ki ek din,ek din ..... .Masai Mara. Sam, SHQ and I had gone for a wedding in the family and during this visit we decided to spend some downtime at the Orange County resort in the area. The fact that Nagarhole was across the river was a huge attraction for me. I thought it would be a wonderful experience. However, I did not know that unless you are staying at the government lodge (JR or something), you are put in an 18 passenger bus. I tried my best, even said I would pay for a private vehicle but they did not allow it. So we crossed the Kabini river every day and boarded this school bus like vehicle which slowly collected people from several other lodges before entering the National park. Once there, the thing was so noisy that all the animals ran away the moment we approached them. The lodge on the other side had several small jeeps and I could see people in smaller groups going around on the game drives. I think we probably spent no more than 90 minutes inside the park itself each time. Perhaps some time in the future I may make a special trip and stay at the other lodge. Having been to most of the major wildlife destinations in Africa I see a big difference in the way things are done in India. For people like me who are not casual tourists but really want to spend a lot more time with the animals, it is not a happy experience. Even in heavily visited places like the Kruger or the Serengeti, they have made arrangements for people to pay for what they want. There are basic rules in place of course, for example you cannot leave any camp before sunrise and absolutely have to be back by sunset (though there are some exceptions). And yet, they allow you to stay for as long as you like within those hours. Each camp has its own vehicle and you can either go cheap, i.e. have up to 12 people in one vehicle or pay for exclusivity and have just three, with each photographer getting the entire row with both sides available to him. Most of these vehicles are extended land rovers with three or four rows behind the driver. Of course you pay a very hefty premium for a private vehicle but if you share the costs with friends it is not so bad. Then there are private game reserves like Sabi Sands in Kruger and the Conservancies in the Mara where you have exclusive access to thousands of acres of game reserve where the general public is not allowed. Again, you pay a very high price for this, but the point is it is available if you want to and have the means to. Thanks for your kind words. These days I shoot mainly Sony mirrorless, have been through all of Canon's offerings over the years. I have used several other brands in an ever frustrating search for the ideal system and have realized that there is none. Settling for a compromise, I now use Sony a9 and a7r3 as my main cameras for wildlife and landscapes respectively. All the photos I posted here were taken with the a9 and the 100-400 GM lens, in fact the sunset photos were taken with the 1.4x teleconverter on the lens. The elephants were really far off. I've used Canon's 500 and 600mm lenses in the past and I am hoping Sony will come up with its own versions although the weight is forbidding. Don't worry, you will get to the Mara one day, just have to decide you want to go there. SHQ and I went there in 2007 as a gift to ourselves for a slightly belated 25th wedding anniversary. Could not afford it before that. Photography is the only passion I indulge in and She Who Must Be Obeyed allows me to indulge. Here is another one from the same trip to Botswana last year. 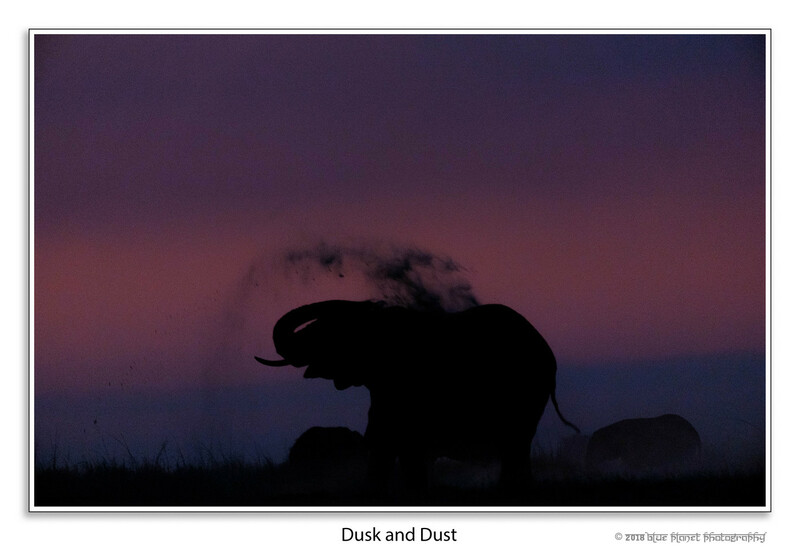 This was taken at ISO 2000, Sony a9 with 100-400 plus TC at 560mm, long after the sun had set, but the glow in the sky persisted behind the elephant rendering him in silhouette. I like this one a lot for its simplicity. How about this for a dramatic image of a Peregrine Falcon! I borrowed the Nikon 500mm f4 lens from a friend. Just tried some test shots with my D300S on the terrace of my home. Few from them. All hand held. Sam, one of the hardest things to photograph is birds in flight (BIF) and you've done very well with this. You always need a big lens which means the rig becomes heavy and that much harder to hand-hold. Using a tripod means limited mobility, so it is always a compromise. One thing you could try is a 70-200 f2.8 with teleconvertor. It is a much lighter rig, easy to hand-hold and will give you decent results. Nothing can compare with a supertele prime but then you have a much heavier lens to worry about, not to mention the huge cost if you were to buy it yourself. If you are using an APS-C sensor camera, the 70-200 plus 1.5X (for Nikon) becomes a 450mm lens for you at the long end. Another way to go would be to get a 400 f5.6 lens which is much lighter and would be sharper than the zoom with teleconvertor. Again, with your camera it would give you a 600mm reach. I love birds myself and would really like to see the extensive range of species in India. However, as with anything else, one needs the time and opportunity. Africa of course is fantastic for birds, especially Eastern areas. In the US too there are places one can go to for special workshops and such. Sadly, I live in a very busy part of suburbia and get a very limited number of species in my backyard. Otherwise if you put up a feeder, you can attract a lot of birds to your own house and then photograph them from a blind. The frog was perched on a wicker basket when O'Neill finally got the shot. 2 weeks back I met with an accident and had injured my biceps tendon.Hence could not reply earlier. Yes, 70-200mm with the TC would make a very handy telephoto lens.But I am not sure how it would handle the 2X atthe longer end. While I was living in NYC, I had the Nikon 300mm 2.8 AF-S Lens. Paired with the d300s it would produce stunning results. Unfortunately, I had to let go of it there rather than carrying it with me while I moved for good. I used to visit 2 places for birding in NYC i.e, Jamaica Bay Wildlife Refuge & Nickerson Beach. Both had good subjects. Some of the shots from the 300mm with and without the TC's. Sorry to hear that , it takes at least six weeks to recover from an injury like that. Hope you are feeling better. At 2X any TC starts to lose sharpness which is noticeable if you compare side by side. However it would give you the shot that you may not get otherwise. I take it with me on my trips but rarely use it, preferring the 1.4x and then cropping into the image. However, your photos above are very nice even with the 2X. Very cool images Sam. As I said earlier, BIF is hard to do and you've got a great one of the skimmer. with the above rig, you've got from 450-900mm range with the D300s if I've got my numbers right. At that magnification, hand-holding is very difficult. But you can see, with the TC, there is softening of the bird especially with the cormorants. What a small world it is. I am only 20 minutes from Nickerson Beach and often go there in the summer when the chicks are hatching. Never been to Jamaica Bay, to get really close you've got to get into the mud I am told. One of these days perhaps. I had taken my Canon 600 for a shoot there once, here are some pics. Sold that a while ago, so now I have the Sony 100-400. The results are not the same of course, you cannot compare the zoom with a super prime. The sky was a little blown, I made it a bit more dramatic to pronounce the sun and yes in the evening, processed it in lighter.